The mighty and the notorious, Gosport Road is perhaps the best example of how much something can change within 100 years. It was designated A32 in 1922, and still holds that status today. 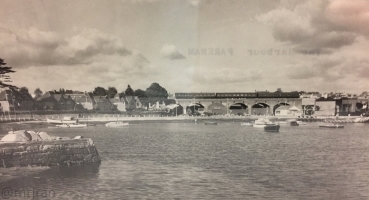 Records indicate that for the past 50 years, pretty much since the Gosport line closed in 1953, there have been talks about what to do about "the Gosport road problem". Central government has generally refused funding for what they perceive as a regional problem. Various proposals have been made, both across the creek (which made for objections to dualling the road online as this was apparently going to happen soon) and heading west through Cams Alder. Traffic along the Gosport Road corridor is pretty much the source of all of Fareham's traffic problems: those who said that a widened road would only fill up with traffic certainly had a point! 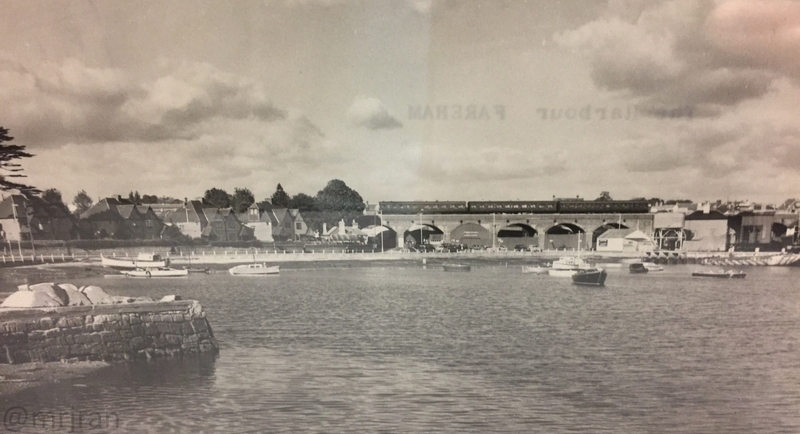 When plans to build the M27 south of Fareham were scrapped in 1960, the government conceded that Gosport needed a six-lane road to the north and a bridge to the east. That didn't happen. The first thing of note is the Gosport and Fareham Tramway. In 1906, The Provincial Tramways Co. decided to change their focus from horse-drawn trams around Portsmouth (and later Gosport) to an electrified tramway between Fareham West End and Gosport. The route was West Street (from the station), Portland Street, and then the entire length of Gosport Road, following the A32 route in to Gosport Hard. They stopped in 1929 with the arrival of buses, and had been powered from a depot in Hoeford, which true to form is now one of First Bus's regional depots and home to the only remaining section of tramway (although in some places the rails supposedly survive under the new road surface). In their heyday, they ran every 15 minutes and cost 4d for the full journey. The track was a mixture of online sections (through Fareham), and where there was space for it, offline, and the vehicles were open-topped and provided little protection from the weather for drivers. The start of the road has always been where Hartlands Road meets Quay Street (for many years the two formed a looped one way system), although the two used to come through the railway arches to meet, which can still be seen in the shape of the western retaining wall, which allowed for what was a very wide footway. Access to Upper Quay is provided here, known locally as Hitch-a-Bow Corner. The roundabout moved northwards when Western Way opened. 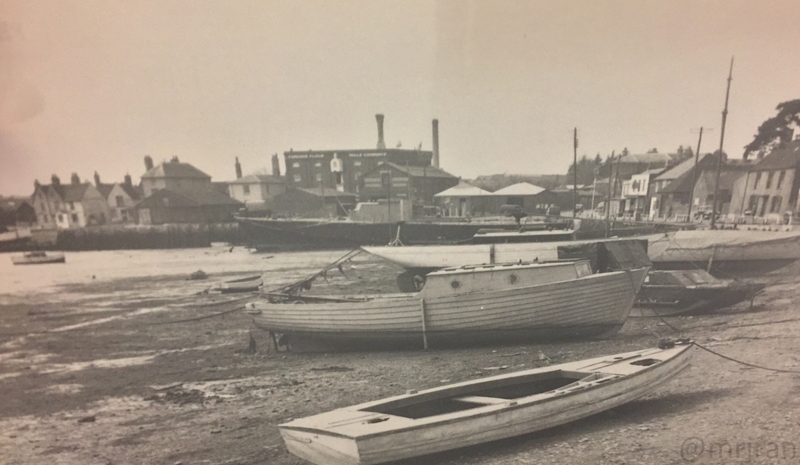 It is difficult to imagine how busy the area around the quays once was, not at all helped by the changes to Gosport Road, along which ships would have once been moored. Calls to improve the safety of this road were rife, with a history of people falling in to the quay, but it was never actually fully barriered until the 21st Century. 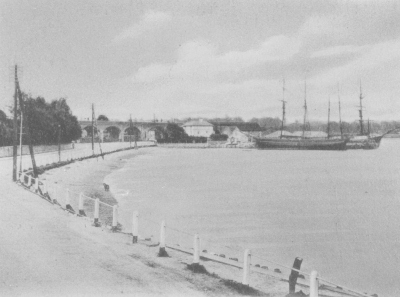 In its prime, a regatta was held on the creek here ('creek' nower days tends to only refer to the section by East Street). 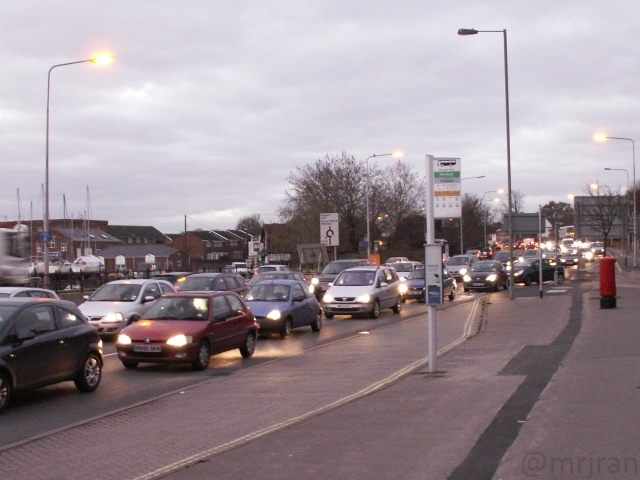 With motor traffic becoming an important consideration, there was a very long and drawn-out debate over whether Gosport Road should be upgraded, or whether a new road should be provided. Once the motorway was open and it was clear no new road would be forthcoming, a package of improvements was put forward, the first of which was to make the northern half of Gosport Road a dual carriageway. This opened in November 1983, costing £1.1 million, and was mostly achieved by extended the road into the quay. In the 1930s, Belvoir House was demolished to make way for the housing area around Belvoir Close, with a small stream marking its boundary. 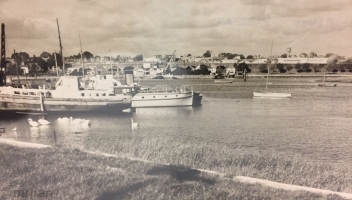 Its location was on slightly higher land as Gosport Road itself was known to flood at high tides. The Lodge survived this demolition. Elmhurst House, which is immediately next to it, was demolished to allow for the diversion of the road. 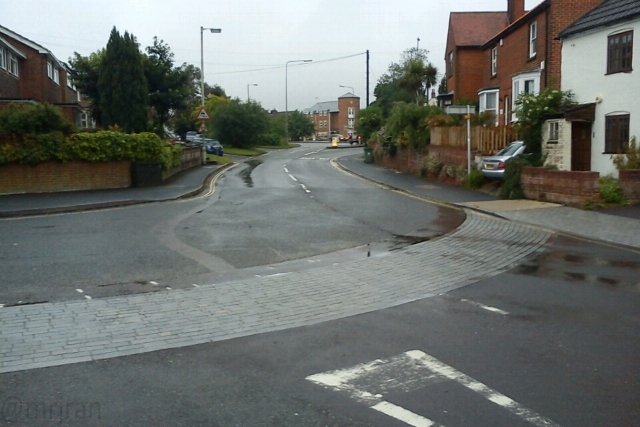 The original alignment of the road here is obvious - down what is now a footpath over Gilly's Creek, onto Old Gosport Road, in what was Town Quay, past the Castle In The Air Pub, and then up towards Mill Lane (once Windmill Lane, now without its windmill; the two roads are on a perfect alignment). 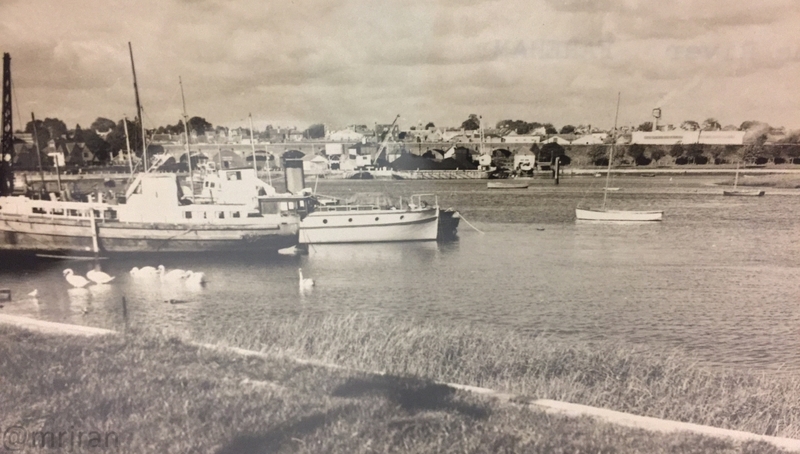 Few houses were lost when the road was upgraded because it was mostly raised above marshland, but approximately 10 were lost for the construction of what is erroneously known as Lower Quay Roundabout. 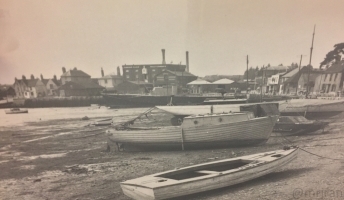 In Lower Quay/Town Quay was the Electric Light Works and a Corn Mill. Rose Cottage became Brook House. It is easy to be mislead by Old Gosport Road: the extra stub by the roundabout, which is used mostly for car parking, was built when Southfield Lodge was demolished in the 1960s and isn't a clue as to the alignment of the original road. Unlike Old Gosport Road, the redundant section of road outside the printers is the old alignment. From here onwards, the current northbound carriageway is the old road (although not a direct replacement). 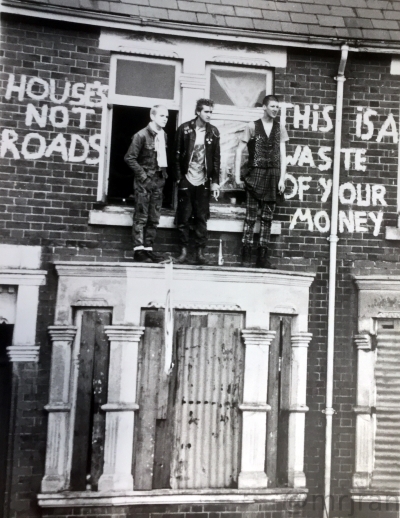 A row of houses on the east side called Albert Terrace were demolished to achieve this. The space their garden left allowed more modern facilities, such as the petrol station, to be added. The church/school was moved at the same time. This project was met with opposition from residents, forming a campaign "homes not roads", mirroring a much higher profile movement in London. Mainsail Road replaced the Alverstoke & Fareham Laundry Earls Road once joined in here, in an area once known as Ropewalk Fields. At number 121 Gosport Road was the post office. To the west, Butlers Cottage became Beaconsfield House at the start of the 20th Century. This and a football ground were demolished in the 1950s to create Beaconsfield Road. Some of the buildings are set back slightly from the road. This allowed for front gardens, but today it is publicy-owned and has proven useful in allowing parking on the road (even if parking here is difficult at best). One objection to widening the road was that it would carve up the area. Today this is a very real problem, but the complaint at the time was that elderly people couldn't use the footbridge, hence traffic lights were provided by the petrol station. At Cams Alders (taken over by Tom Parkers Dairies), where Redlands Lane joins, Elms Road was added in the 1930s, on the site of Earls Farm. One 1970s plan had a new Gosport Road leaving here and taking a new western route down to Gosport. Here Gosport Road erred slightly to the east (following the eastern arm of the road today), meeting Newgate Lane on the bend. In 1968, this became sort-of roundabout arrangement, in anticipation of the Newgate Lane flyover being added in 1986. Only two houses on the split itself were lost, although there were more terraces further down and some of Cams Alders was taken too. Salterns Lane mainly serves housing now, but the sewage works where Watersmeet is was once the main destination. South of here, and down to the boundary with Gosport, the road started the century as a dusty path through fields, hence the parallel tramway, and slightly further away, the main railway line. As part of the "Gosport package" alluded to further up, minor changes were made to the road from here to Forton in 1990. Most of the housing was added in the 1940s, Geoffery Crescent was added in the 1960s, while some of the early houses by the Hoeford ("Hoe Ford") Depot were demolished to form the factory which is now an industrial estate. Between some of these houses, gaps were left, one of which forms a rather convenient access to Henry Cort Way (the new Eclipse Busway). Here, a motorway junction would have been built, had the original plans gone ahead.